Sealux and BAL offer a range of different but complimentary problem solvers that integrate to provide a complete waterproofing solution when tanking walls over shower trays and baths. Lifestyle and shower technology has changed. Our daily use of modern high performance showers has created new demands on traditional materials. Property damage caused by water leaking through joints and moisture penetrating tiles and grout, are frequent problems in today’s shower environment. Sealux offer a choice of two joint sealing systems both of which provide a flexible and long lasting waterproof bridge between the BAL waterproofing membrane and the adjacent ledge of the shower tray or bath. The HydroHALT Joint Sealing System combines an upstand strip with Sealux-N silicone and a backer rod. HydroHALT meets relevant BS 5385 recommendations. 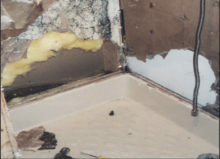 Aesthetically after tiling, a silicone joint is seen to extend between the tile and ledge. The Sealux Joint Sealing System combines a PVC strip with Sealux-N silicone. Aesthetically after tiling, the PVC trim is seen to extend between the tile and ledge. This PVC trim conceals and protects the silicone from the shower environment. BAL offer a choice of two tanking systems, both of which provide a flexible waterproof barrier between the tile adhesive and shower wall to protect against moisture penetration through the tiles and grout. 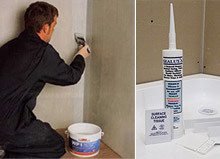 BAL WP1 tanking kits combine a surface primer with a flexible liquid waterproofing membrane and polyester matting/tape. BAL WP1 is suitable for interior wet areas, the WP1 liquid membrane is brush or steel float applied and sets in 24 hours. BAL Tank-it is a fast setting simple to use two part mix applied conjunction with a joint scrim tape. Tank-it is approved for interior and exterior use over walls and floors subject to total immersion. Tank-it can be tiled over 90 minutes after application. Today’s hi-performance hi-use showers makes waterproofing walls over pre-installed shower trays and baths more a necessity than a luxury. Water sensitive backgrounds like plywood and plasterboard absorb moisture causing loss of adhesion between tiles and wall. Using the leading joint sealing solution from Sealux Ltd with BAL’s renowned tanking kit gives unrivalled protection. 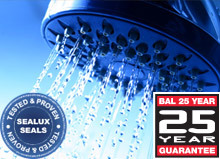 BAL products are guaranteed for 25 years. 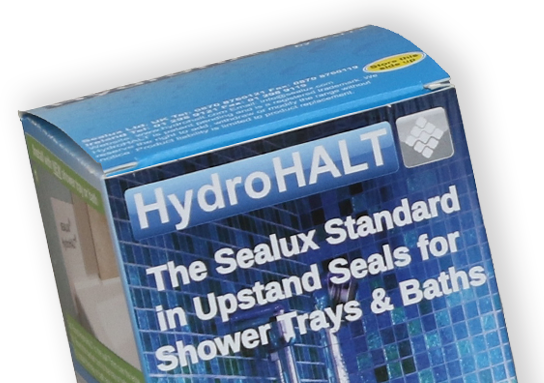 Sealux seals are endorsed by Europe’s leading shower wall panel manufacturers.